Lacewood, also called European Plane and Buttonwood has a quarter-sawn cut. Species originates in Europe. A unique look with its fleck figuring. Lacewood has a straight grain with fine to medium textures and reddish-brown coloring. 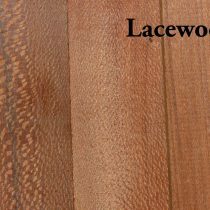 Lacewood is used for cabinets, fine furniture, carvings, trim and veneer. This species typically runs narrower than some of our other species with average widths between 3-1/2″ and 5″ wide.